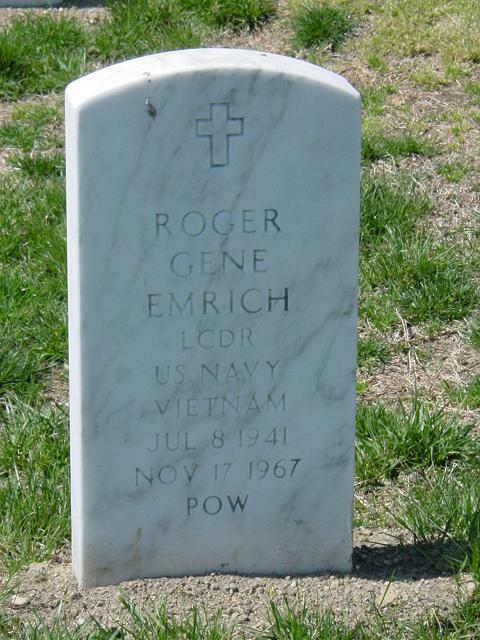 Roger Gene Emerich was born on July 8, 1941 and joined the Armed Forces while in Miami, Florida. He served as an aviator in the United States Navy, Battalion Air Squadron SQ 161, and attained the rank of Lieutenant Commander. On November 17, 1967, at the age of 26, Commander Emrich perished in the service of our country in North Vietnam. The human remains of five American servicemen previously unaccounted for from the war in Southeast Asia have been identified and are being returned to their families for burial in the United States. They are Captain William C. Clay, III, U. S. Marine Corps, of Henderson, North Carolina, and Lieutenant Commander Roger G. Emrich, U. S. Navy, of Miami, Florida. The names of three additional U. S. Army soldiers are being withheld at the request of their families. On April 12, 1967, Captain Clay was piloting an A-4E Skyhawk on a close air support mission over South Vietnam. His aircraft was hit by enemy fire, exploded and crashed. No ejection seat or parachute was sighted by his fellow airmen as the plane crashed. Two joint investigations with the Socialist Republic of Vietnam in 1993 and 1995 failed to locate his remains. However, as one U. S. team prepared to leave Vietnam in 1995, they were approached by a local farmer who turned over human remains and associated artifacts. These remains were later identified as those of Captain Clay, and DNA testing was one of the forensic techniques used in the process. Commander Emrich, a radar intercept officer aboard an F-4B Phantom, was flying a combat air patrol mission over North Vietnam on November 17, 1967 when enemy surface-to-air missiles were fired at his aircraft. The wingman lost sight of Lt. Cmdr. Emrich's aircraft momentarily, then observed it spinning toward the ground. The wingman radioed “bail out,” but the plane crashed with its canopies still in place. While evading more SAMS, the wingman circled the crash area twice and observed local Vietnamese surrounding the wreckage. Search and rescue attempts were discontinued the next day because of lack of contact with the crew members. Three joint U.S.-Vietnamese investigations in 1994 and 1995 located witnesses to the crash site, and later found aircraft wreckage and the remains of Commander Emrich. With the identification of these servicemen, 2,128 Americans remain unaccounted for from the war in Vietnam. The U. S. government welcomes and appreciates the cooperation of the Government of the Socialist Republic of Vietnam which resulted in the accounting of these airmen. We hope that such cooperation will bring increased results in the future. Achieving the fullest possible accounting for these Americans is of the highest national priority. At age 82, Elmer Emrich got so fed up with waiting for the Pentagon to bring his missing son home from Vietnam that on his own he found the site where Roger Emrich's plane crashed. "We'd just been letting this thing ride along for too long, thinking the government was going to do something about it," Emrich, now 88, said of his remarkable journey to Vietnam in 1991 with Roger's widow. Emrich's tale was emblematic of the growing frustration at U.S. recovery efforts felt by many of the families of the 2,127 servicemen still listed as missing in action from the Vietnam War, including Army Sergeant Robert F. (Bobby) Preiss Jr. of Queens, New York. As first detailed by Daily News columnist Jim Dwyer last week, the Preiss family has been told that fragmentary remains found on a remote hillside in Laos were identified through DNA analysis as Bobby's, but a full excavation of the site was not planned until late 1998 at the earliest. "I don't know if it's the government's fault," said Emrich's widow, Eva, 54, a travel agent in San Diego. "I think they're doing the best they can, but you can get so disgruntled." She said: "There were so many conflicting reports. There was a question of whether or not Roger was a POW, or died at the scene. My father-in-law needed and wanted closure on this, so we just decided to go." Because the United States had no relations with Vietnam in 1991, the Emrichs arranged through the United Nations to go to Bangkok, where they were given visas by the Vietnamese and flew to Hanoi. William McGrath and carrying radar intercept officer Navy Lieutenant Commander Roger Emrich, 26, was shot down by a missile. It was also Eva's birthday. The Emrichs said the Vietnamese were extremely cooperative. "I had these maps with coordinates where we thought the plane went down but they told me, 'We don't need your maps; we know where this is,' " said Elmer Emrich, a retired FBI agent. With a car and translator provided by the Vietnamese, the Emrichs went to a village about 30 miles southeast of Hanoi, where they found the engines from Roger's plane propped up in front of the town hall as a symbol of local pride. A villager who had seen the plane go down took them to the site in a rice paddy 3 miles away. The spot was grown over, but Eva found a tiny piece of the wreckage to take back to the Pentagon as proof, along with photos of the site. Still, the Emrichs had to wait until last December before U.S. search teams excavated the site and had a positive identification on Roger's remains. Ann Mills Griffiths, executive director of the National League of Families of the missing in Vietnam, said the Emrichs are not alone. "Some of our members are getting so frustrated they're saying 'The heck with it, I'll go on my own' " she said. "Unfortunately, they're almost always disappointed. It's not an easy thing to do." said, the agreement with the Laotians is to search from north to south. The next 40-member search team will go to Kham Muon province late next month for a 30-day stay, and another will go to Savanna Khet province about a month after the Kham Muon team comes out, Claypool said. She said that the site where Bobby Preiss was killed on patrol in 1970 is in Xekong province, two provinces south of Savanna Khet. "All the families have been waiting for far too long," Claypool said.